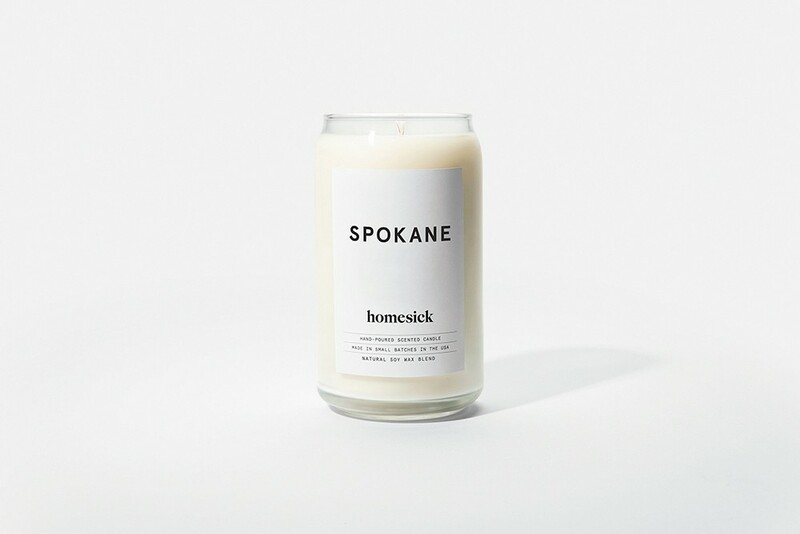 What, exactly, should a Spokane-scented candle smell like? This product is completely, frighteningly real. I've been spending way too much time lately trying to get a big ol' whiff of Spokane. This bizarre impulse comes from social media, home to all of humanity's most unsettling urges. See, I've seen ads for candles that are supposed to smell like Spokane. And that made me realize I'm not sure what, if any, signature smell Spokane has. Right now, it smells like pollen getting ready to bloom. This is not great for my sinuses, but it's an improvement over when I first saw the Spokane candle advertised in the dead of winter. At that point, I couldn't smell much of anything, which lined up nicely with my inability to feel much of anything. The ad must have been going around, because a few weeks later, a friend from grad school posted a photo of the picture on Instagram, minus any description. He asked his friends to "tell me what this scent is." Since he knows a lot of writers, he got some descriptions that were almost poetic. One friend mentioned the smell of beer and popcorn at the dearly departed Swamp Tavern. Another referred to "old books" in her answer. And then there was me. I typed, "Does Seasonal Affective Disorder have a smell?" But let me be fair to the candle company (that I will not name, because they clearly have enough of an ad budget). Depression is not a scent people look for in $30 candles. If someone with $30 wants to be depressed, they'll buy vodka like a normal person. The actual product description is much more optimistic: "Herbs and honeysuckle reminiscent of Centennial Trail hikes through the sunny side of the state. Home of 3-on-3 basketball. Notes of carnation to celebrate fathers around the world." There's a base note of powdery musk. I think that's supposed to represent dads, or maybe I missed out on the Hoopfest tradition of dousing yourself in baby powder before each game. I'm sure all those things smell fine. But they don't smell like Spokane to me. I tried to ask a few non-Instagram friends what, exactly, a candle claiming to represent the city should smell like. A bunch of people mentioned lilacs for the Lilac City. One friend looked a little lost before spitting out, "People's vapes?" The more I think about it, the more I think it's good that there's no universally recognized smell that makes you think of Spokane. No one is rushing to bottle up the Tacoma Aroma. And I'm from a small Southern town, one where the most distinctive smells come from either a paper mill or a chicken truck on the freeway. But on the third hand, the candles this company sells aren't designed for people who live here. They're designed for people who leave and want a reminder of home, even if it's mass-produced and not terribly specific. When I leave town, what scents are going to stir up memories of Spokane? I'm a freelancer without a proper office, which means I often work in coffee shops and arrive home with the smell of espresso beans on my clothes. Then there's weed. I know the candle description mentions "herbs," but I don't think they meant that kind. I have never smelled as much weed as I have in Spokane. That's not saying much, considering I grew up Texas. Yet weed in Spokane is like barbecue in Texas: the smoky odor is always in the air, and you can usually find a friend who will either offer you some or say, "Hey, you know what sounds good right now?" I'm not a smoker, but I find the routine comforting. Not every scent is reassuring. I've been here since 2013, and I barely remember the first wildfire seasons. This might be recency bias, but now it feels like I'm choking on the air every August. Pollen is bad, but I can at least take decongestants. In late summer, there's nothing I or anyone else can do to get the particulate matter out of the air. Thinking through all this made me realize I should leave the candle-making to the experts. Coffee is a decent candle scent, but weed is not, and, well, candles already smell like fire by default. I'm not sure how much longer I'll have a Spokane address. But when I leave, I won't need a candle. The memories of smells good and bad will be vivid enough. The original print version of this article was headlined "Ooh, That Smell"